Joy: I treat many of them like my own grandparents and relatives, but it’s a lot less work to say “hi” because they’re right across the sidewalk. This also means that I have gotten so many different perspectives on life – politics, culture, family, etc. Rather than believing everything my parents’ believed, I had other people to draw experiences from. I was surrounded by different perspectives of people who respected each other’s opinions. Thanks to Joy for her insight in the abundance of cohousing! If you or someone you know has been influenced by cohousing and you’d like to share it with us, please let us know! Written by Jessie Durrett, daughter of cohousing experts and authors Charles Durrett and Katie McCamant. 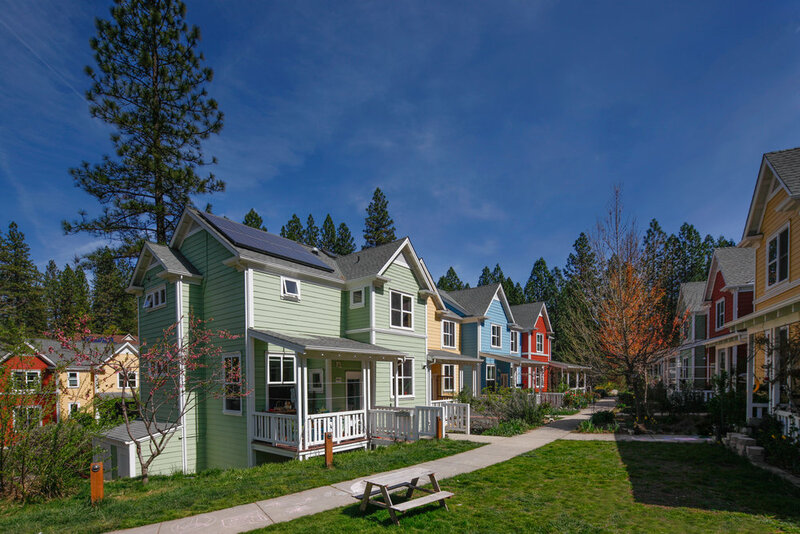 In this very insightful essay, originally written in 2017, Jessie describes how growing up in cohousing positively influenced how she relates in the larger world. Thank you Jessie, for sharing your childhood experience with readers. I am a big-picture thinker who contemplates how intersecting issues and policies affect real people, whether they share my office or are caught in a civil war on another continent. I take an inquisitive, enterprising, and collaborative approach to solving problems in my own life, broader community, and work. I largely attribute my intellectual curiosity and prioritization of the collective good to my upbringing in cohousing (an intentional, intergenerational neighborhood of clustered private homes where people share meals and amenities). From an early age, I was participating in lively discussions about the Iraq War and cooking dinner for forty of my neighbors. Joining finance and landscaping committee meetings showed me the challenges and opportunities of building consensus and participatory decision-making. As a twelve-year-old, I advocated for community meal times that accommodated my athletic practice schedule and the needs of families with toddlers. My neighbors encouraged me to explore my interests, taught me about their careers, and invited me to their churches. Cohousing provided an exceptional venue for me to nurture my aspirations to effect positive change locally and globally. Beyond living in cohousing, my parents dedicated their careers to designing, developing, and championing this type of multifamily housing. With them, I visited construction sites, attended planning commission meetings, and spent time with cohousing groups in Denmark, Japan, New Zealand, Austria, and Canada. Working in my parents’ office in high school, I compiled media stories and promoted cohousing to policymakers. Realizing the benefits that cohousing provided to me, I now lead workshops at national cohousing conferences on how to create a culture in which children can thrive. Community was the foundation of my upbringing, which explains the value I put on interpersonal skills and my conviction to advance the public good. My desire to build community transcends personal, professional, and educational settings. As a Student Senator and Resident Advisor in college, I led efforts to improve the health services available on campus, arranged service projects, and worked to create inclusive learning and living environments. I have also become a leader within the ultimate frisbee community. After captaining my college team and playing for a club team in Washington, DC, I co-founded and captained a new women’s club team. We started from scratch in 2015 and quickly sold our vision to coaching staff and the hundreds of players who tryout each season. Today, we are ranked 27th in the country. I take pride in our collective drive and contributions to the national women’s ultimate scene. I have also fostered local community while thinking globally as chair of the Young Professionals in Foreign Policy’s gender discussion group in Washington, which analyzes gendered implications of conflict and informal mining in West Africa, among other topics. The values and skills I learned through my unique upbringing in cohousing help me take on complex challenges in both personal and professional situations. As I advance my career in foreign policy, my deep-seated dedication to community will continue to inform my interests and decisions. Original post from Alice Alexander can be found by following this link.